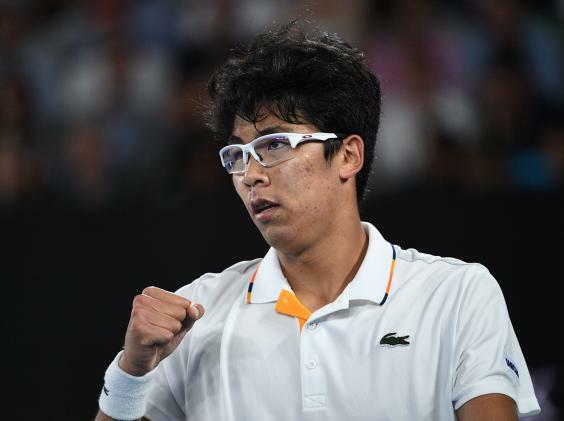 The 21 year old Korean who becomes the first Korean single player to reach the Quarter final of a grand slam played superb tennis throughout to see off favourite Djokovic. The Korean showed what he was capable in the earlier round when he defeated world no. 4 Alexander Zverev to get the fourth round. But that didn't prepare him for the euphoria that came with defeating Djokovic. He said: "When I was young I just tried to copy Novak because he was my idol." "I'm just honoured to play with Novak again and I am happy to see him back on the tour." Djokovic believed the pain from his elbow was a factor in his defeat: "It's frustrating, of course, when you have that much time and you don't heal properly, but it is what it is. There is some kind of a reason behind all of this." "I'm just trying my best obviously because I love this sport. I enjoy training. I enjoy getting myself better, hoping that I can get better, perform and compete. Today was one of those days where, unfortunately, it was too much to deal with." The six time Australian Open winner believes he now needs to reassess everything to know what the situation is in order to understand what his next move should be like. Djokovic continues: "The level of pain was not so high that I needed to stop the match, even though it was obviously compromising my serve. That., of course, is a big shot, especially against Chang, who returns well and gets a lot of balls back. I wish I could have had more free points on first serve." He also praised Chung: "He deserved to win, no question about it." "Whenever he was in trouble, he came up with some unbelievable shots, passing shots. From the back of the court, he was like a wall. It's impressive. I wish him all the best."